Perfect Remains caught my eye for two reasons. One is that it is set in Scotland, one of my favourite places and the other is that it has an unusual premise, in that a woman is murdered and her body found, and yet miles away she screams in a hidden room. Intriguing, right? What I wasn’t expecting was a very attractive French policeman as the main character (and my latest book crush). DI Luc Callanach is damaged but strong and hugely likeable. He’s actually half-Scottish but isn’t all that happy to find himself in a country that doesn’t have quite the style that France does. This is not the most fast-paced thriller although it does move along really well. What it is is a well-written police procedural with a twisted killer at its heart. I did cringe a few times at the things that were happening. There were some very gruesome and graphic parts but the fact that they made me feel like that shows that they were portrayed well. It may not be everybody’s cup of tea but if you can stomach it then this is a really excellent read. It’s definitely not for anybody who is afraid of going to the dentists! I shall say no more…..
Running alongside the main plot of the strong women who go missing is DI Ava Turner’s story about abandoned babies. I liked Ava a lot and think she and Luc will go far as characters in the series. This book also introduced a number of other characters who I think will pop up in the future such as Ava’s friend, Natasha Forge, and Luc’s colleagues at the police station. This is a book that has a humdinger of a storyline and it kept me interested all the way through. We know from the beginning who the killer is and I thought it was clever that we witnessed the cat and mouse chase from both points of view. Helen Fields is certainly a new crime author to watch and I’m looking forward to seeing what happens to Luc and Ava next. Thank you to the publishers and Amazon Vine for the review copy. 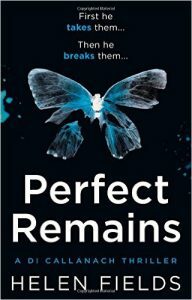 Perfect Remains is published by Avon on 26th January 2017.